Members of the Loveland City School District (LCSD) Transportation Department participated in the regional “Road-E-O” in mid-October, an event where school bus drivers from seven counties in Southwest Ohio come together for a day of competitions to test their driving knowledge and skills. After taking a written exam, the participants drive a school bus through a series of tests to determine their maneuverability and practical skills. 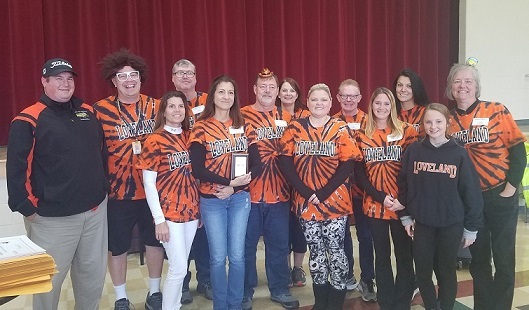 One of Loveland’s teams placed second overall in the regional competition. Valerie Daugherty was the top individual finisher, qualifying for the state competition on October 27, where she placed eighth out of 48 contestants. “It is wonderful to lead a staff that puts so much participation, effort, and care into transporting students safely,“ said LCSD Transportation Supervisor Greg Osie. The annual Ohio Road-E-O started in 1964 as a way to promote the safety, professionalism, and recognition of school bus drivers. Photo caption (top image): Loveland School Bus Driver Valerie Daugherty won the 2018 Regional Road-E-O. Pictured, left to right: Jason Leeth (Road-E-O committee for Southwest Ohio), Ken Stevens (Road-E-O committee for Southwest Ohio), Valerie Daugherty (Loveland driver), Brandon Annes (Southwest Ohio School Bus preservice instructor). Photo caption: Loveland at the Regional Road-E-O (left to right): Brandon Annes, Keith Richter, Barb Ramsey, Bill Toups, Lorie Stulz, Len Whitling, Mary Toups, Valerie Daugherty, Tom Wuest, Michelle Winter, Karli Danforth, Brooklyn Winter, Teresa Beatty. Article posted on October 29, 2018.